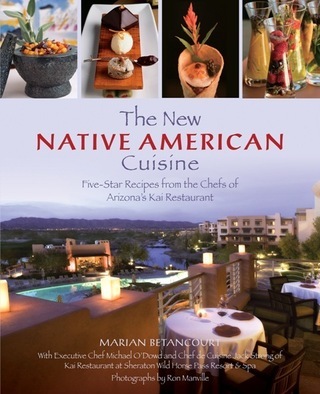 The New Native American Cuisine: 5 Star Recipes from the Chefs of Arizona's Kai Restaurant (Globe Pequot Press, 2009) is much more than a collection of recipes. It is a guide to the rich history and culture of the farmers and ranchers of the Gila River Indian Community. Kai's executive chef, Michael O'Dowd has lovingly restored this heritage using modern techniques. One of only six U.S. restaurants to achieve the AAA's five-diamond status—and the nation's only Native American restaurant to have earned this distinction along with a Mobil Five Star rating—Kai at the Sheraton Wild Horse Pass Resort & Spa, on the outskirts of Phoenix, is redefining Native American cuisine. With classical European techniques, artful plating, and pairing with the finest wines, the Kai chefs bring an ancient cuisine into the modern spotlight. Specialties include grilled elk chop with truffles, sweet corn panna cotta with venison carpaccio, and buffalo tartare with prairie quail egg. A glossary and shopping guide for Native American and desert foods is included along with a list of museums to visit and learn more about the culture.